Day 19/20: the weekend & GMB review. After turning my laptop off last night at around 10:30, I proceeded to bed with my phone in my hand. As a resultant, I fell asleep well past midnight. Due to habit, my body clock woke me up at 6 in the morning but I tried to sleep in (no later than 8). Being in bed while the sun is up always gets me agitated so I was up and out of bed by 7:30. After completing the usual morning routine to wake up, I was immensely craving sourdough toasts with peanut butter and banana slices. No bread was to be found and oatmeal was eaten instead. Oatmeal never gets boring. It was initially intended to either go to the gym for some sort of cardio work or to attend my (already paid) yoga class. I skipped both. Instead I cruised around Youtube and watched random "What I ate today" and lifestyle videos. I had lunch at the normal hour, showered quickly and rushed to work. When the weather feels like it's 2 degrees, movement is slowed drastically. P.S. PLEASE CHECK OUT MY FUNDRAISER PAGE FOR MY 9KM RUN IN SEPTEMBER. CLICK HERE. I shamefully (however not regrettably) ate a few chocolate filled crossaints for breakfast... But hey I worked 9AM-4PM with a one hour lunch break. I required that sugar buzz! And yes, there are better ways for longer lasting energy kicks. The good thing about working this weekend is that I now have money to spend on petrol, i.e. able to drive distances for scenic road trips! Here's July's box contents! 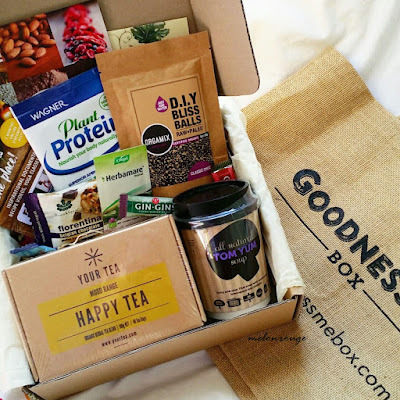 Exciting health conscious goodies to tingle my sensations. Happy tea: has a surprisingly sweet taste however I did not notice myself being any more or less happy before and after drinking the tea haha. I would definitely purchase again from Your Tea to try the different teas they offer. Gin Gin candy: chewy ginger candy... how good is that? The ginger kick is a huge (however pleasant) punch in the face. Wagner plant protein in natural vanilla: pleasant taste however I will continue to try different plant proteins to see which one is most favourable. So far, all protein powders that i've come across taste pretty good. It'll probably come down to macros vs price. Food Matters TV gift card: allows a 3 month subscription to fmtv.com, a collection of films relating to health and welbeing. I've seen quite a few new documentaries, Super Juice Me!, Fat, Sick and Nearly Dead, and Hungry for change - just to name a few... They were all very well worth the watch. All natural Tom Yum soup: I don't normally like the flavour of tom yum however this instant cup of warmth was bearable and maybe even enjoyable. Orgamix DIY Bliss Balls in classic choc: average bliss balls, though with it being pre-mixed, it does save some time and utensil clean up! GMB carry bag: I love this rustic carry bag! When it's summer, i'll definitely be visiting more weekly markets and will be hauling my groceries in this cutie.